BARE Chocolate Massage Oil . Chocolate is loaded with magnesium, copper and potassium which promote a healthful texture and glow when applied topically. And for those watching their weight - there's also the "instant chocolate fix". The aroma alone will keep you away from the office vending machine. Paraben free and made from the finest quality ingredients available. 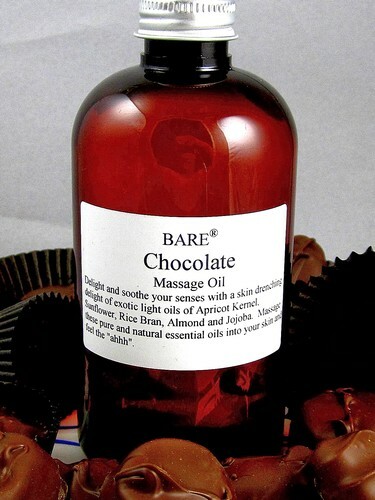 BARE Chocolate Massage Oil is light & gentle to the skin. Rich in vitamins, minerals and linoleic acid (essential fatty acid)and Grape Seed oil which absorb quickly into your skin. Non-GMO Soybean Oil, Sunflower Oil, Grapeseed Oil & Rice Bran Oil, Cocoa Butter Oil, Natural Vitamin E.
BARE Chocolate Massage Oil, offering a full 24-hour skin moisture lock as well as a day-long frolick with the chocolate gods.